Lovely Deborah...I posted this week at Tuesday Cuppa Tea on Burns night too...with a Shelley Thistle but a different shape. Love all your pretty teacups! Deborah, you couldn't pay me to eat haggis! Even though I don't like to eat too much deep fried food, I will take the mars bar instead. Your roses are beautiful and I love how you arranged your teacups. Love the Shelley! If I was starting over again, I would be choosing white appliances instead of harvest gold. When I was getting married, I purchased a few red nic nacs. I have a lot of red in my home now. Mostly red toile though. I always wanted to collect Hummels. They are so adorable! Thanks for your post and enjoy your week, my friend. Hi Deborah, Isn't it fun to change things up a bit? Your roses are quite lovely and what a teacup collection you have! How pretty. Your tea cups are lovely and I like the thistle. Personally, I think ladies need a shower every seventh year at least! haha . . . Vee, you're too funny! I have been sitting here looking and looking at your beautiful teacups. What a lovely collection.... and I LOVE the idea of arranging them on a platter! 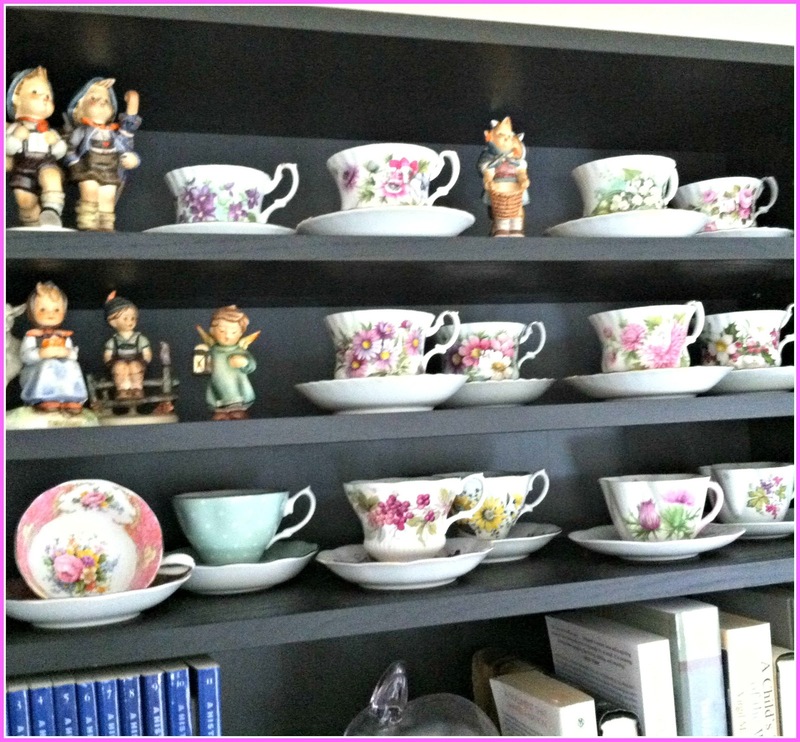 Oh sweet Debra you have such a beautiful collection of teacups and I love the way you've displayed them. I want to play with mine too, but I haven't found a displayed I liked and yours is my fav so far. I will pin it to keep. You must be going thru the best 'mother-daughter' time and all the cherished memories that come with preparing and planning a wedding. Love your tea cups displayed in the platter ... they are all so pretty together! Your display along the bookshelves is lovely too. It's nice to change things up a bit. I'm afraid my teacups are hidden in a drawer in my buffet as my husband doesn't want them on display :( I only have a few in my narrow display case. I'm the opposite to you and love clear, cold, plain water. Probably because I grew up with well water which was delicious. I usually order water at restaurants because I dislike pop (except maybe ginger ale). My BIL is diabetic and he got one of those soda machines and really likes it. He said it makes him feel like he's drinking a pop rather than just water. It's just like club soda, so if you like that, you'll get good use out of the machine. I like Vee's idea of a shower after a few years of living. I know I'd choose different things than the first time -but that's life - tastes change as we change. And I'm still very glad for some of the things I chose at that time. I do love drinking water.I add mint leaves or cut up fruit or lemon wedges sometimes in the summer for a bit of flavor. Diet soda has never appealed to me. My son-in-law likes his soda machine. My daughter and son-in-law like their soda stream machine a lot. I drink San Pellegrino or Perrier. They satisfy now that I find all sodas to be too sweet. That Scottish tea looks delicious - great colour! Just water from Costco keeps me happy and hydrated and that's what it is all about. We don't need that bad sugar. Try adding some fresh lemon juice to give it a different taste. Good question what we would select if we had to start all over... I must admit that after I got first married I have changed somewhat but still have most of the china that I bought the early years of marriage and several other things. None of the glasses but all of the cutlery. 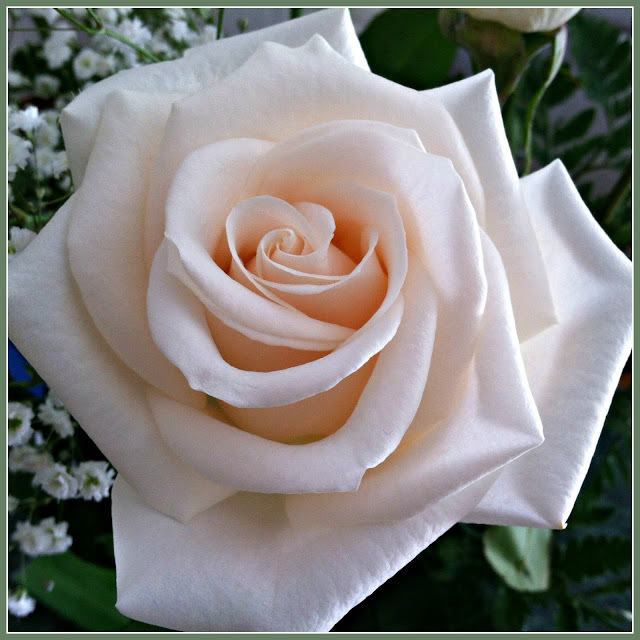 Enjoy this coming period and keep rewarding yourself with white roses!!! Stunning collection, love how you have arranged them on a platter. 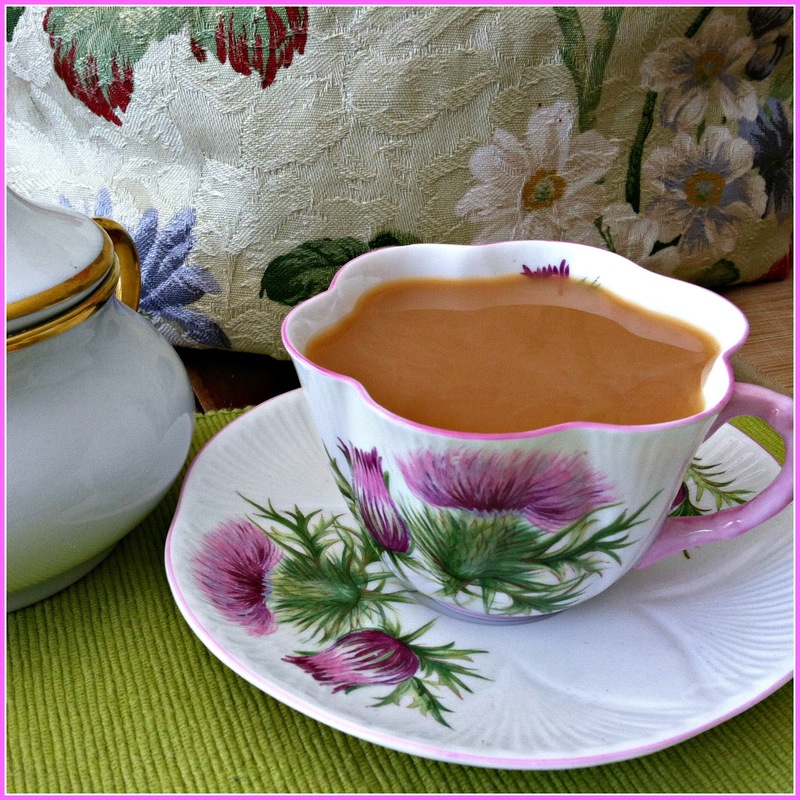 Love the beautiful thistle cup and saucer a real delight. Pondering for a moment I wouldn't change a thing I love all of my little collections and most of it was gifts given with love. That is a wonderful display of cups and saucers! They look so pretty. You sound very busy so I wish you great success on your wedding planning! I'm swooning over all your pretty teacups, Deborah! I especially liked how you displayed them on a platter...may have to try that one day (once I find a big enough platter. Heh)! 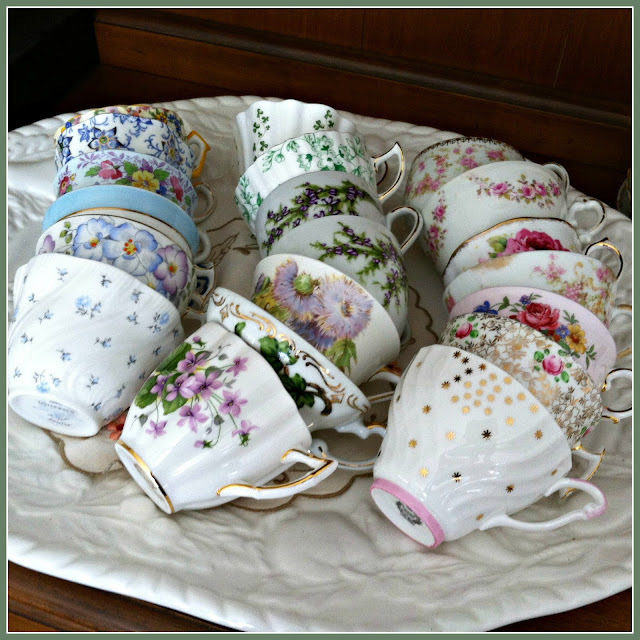 What a lovely collection of teacups! I like room temperature water with either fresh lemon or a little packet of lemon crystals in it. It makes water more interesting. Sounds like you'll be quite busy for several months. I'm glad that you and your daughter can enjoy the planning. I think a shower is a great idea, maybe every fifteen years, or whenever we expect appliances to wear out. Top of my list would always be my KitchenAid mixer, deep red. What a gorgeous collection of teacups... So so delicate and dainty. 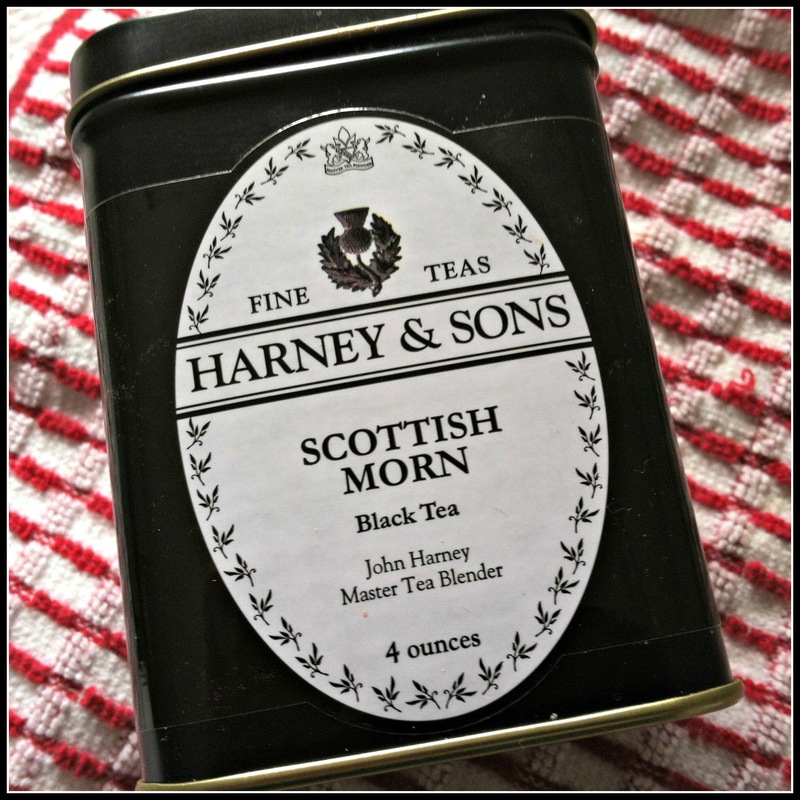 I have never heard of Scottish Morn Black Tea. I definitely have to give it a try. Don't worry about visiting, I struggle with that all the time. Between my full time job, house work and spending time with my family, it is difficult to keep up. Enjoy the wedding plans. Your thistle teacup is stunning but then you have the prettiest tea cups I've ever seen. It is hard to never drink diet sodas. I try to but I still give in every once in a while and drink a diet ginger ale as it settles my stomach. I'm a big water drinker but I don't drink wine or coffee or tea, so it will be hard to give up my diet ginger ale. Maybe I'll try buying roses instead! 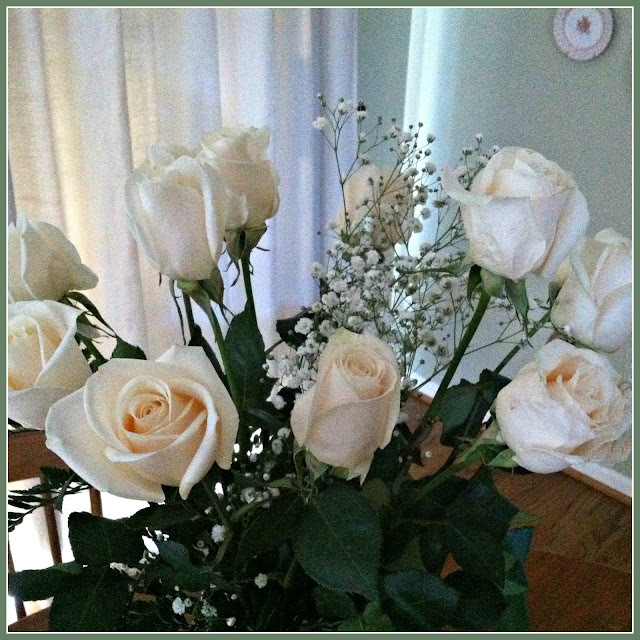 And the roses...be still my heart! They are stunning! Have a lovely week, dear Deborah. Hugs! I was stunned by the close-up photo of the rose, but then I saw your stacks of cups!!! They are just gorgeous. Thanks for sharing. I'm also badly behind in my blog reading, but I've decided to get my act together, stop wasting so much time on facebook, and get back to my blog friends like you :) Enjoy your summer of wedding fun! You can get back to blogging when it's over. We gave up Coke Zero and feel much better. I love your roses and think you deserved them! I love the little stacks of cups displayed on the platter.